There are many aspects companies have to take care of to be successful in this competitive world. From investment, good clientele relations, good workforce to public image, everything needs to be perfect. However, companies under estimate the importance of database and that’s where it suffers the most. This is an information era. Never before has so much information traveled from one place to another at such speed. Because of various highly competent email clients, even companies luxuriously circulate data and communicate at high speeds. But companies forget to take care of their database, and when disaster struck, they have no idea what to do. This article deals with the most prominent email client used by every business – Outlook. Outlook has many benefits to offer all of which are made available to you by one process OST to PST syncing. OST is the offline storage table of Outlook. It has revolutionized the way inter-office communication takes place. It helps in accessing database at earliest convenience. PST on the other hand, is personal storage table. This format works with Outlook. To avail the benefit of mail communication online and offline, OST to PST syncing takes place. MS Exchange server does the task. But When, MS Exchange server is not there to help companies in this task, , then OST files are converted to PST format. This is where OST to PST Conversion process enters. OST to PST Conversion solves many Outlook problems. When Exchange server crashes or is down for maintenance, you convert OST to PST. When you lose OST files or they get corrupt or damaged, to make them work with Outlook, you convert them to PST format. This is the only way you can import OST in Outlook, and continue your work. But the process should not be done manually. Many a times, IT sector professionals have taken the task of converting OST files to PST themselves to please their bosses. To their dismay, their companies lost more data in the process, and they jeopardized their careers. This is a very risky task and should never be done manually. This article has been written to inform you that a suitable tool compatible with functioning of big businesses has arrived. This tool will solve your company’s problem in no time at all. This tool is OST Extractor Pro. OST Extractor Pro by USL software has been a groundbreaking tool for OST to PST Conversion process. It has made the process easy for laymen and professionals alike. The tool comes with a self-explanatory user interface which allows the process to unravel in a smooth and simple way. No training is required to convert OST files to PST with OST Extractor Pro. This tool is highly suitable for businesses which can have unprecedented amount of database. You can convert this database to PST format easily in no time at all. OST Extractor Pro employs batch strategy to efficiently execute its task. 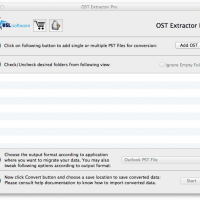 The best part is that OST Extractor Pro comes with a demo version. To verify this tool for your company, download it right now at https://www.ostextractorpro.com/! OST Extractor Pro will make your company’s OST to PST Conversion process a delight.